Do a quick search of “Ignorance of Geography” on Google and you’ll be served thousands of articles discussing how illiterate Americans are when it comes to Geography. We’ve all read these articles — 63% of young Americans can’t identify Iraq on a world map — so I won’t bore you with more numbers. Although as a Geographer I personally have a hard time ignoring the almost steady stream of ignorant statements on the news or on social media that appear whenever an event happens outside of the United States. 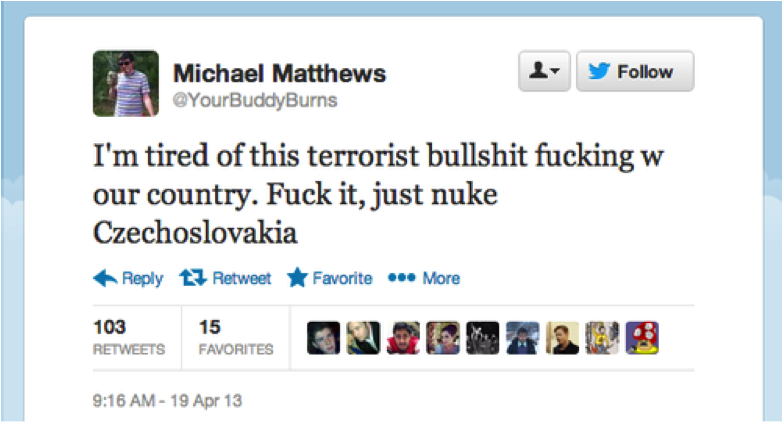 Take for example the Boston bombing in April 2013. Soon after the public learned that the Tsarnaev brothers hailed from Chechnya, many took to the twitter-verse to make sure their voices were heard. Whether or not the retweets and favorites were meant to be ironic or not is up for debate. What can’t be debated is the long list of people who tweeted very similar opinions regarding the erroneous origin of the brothers. Ignoring the fact that they got the country wrong perhaps they should also know that Czechoslovakia dissolved in 1993. Perhaps this is the case because Americans are shielded from much of the world’s news. Turn on CNN (Aka Malaysian Airline, Ferguson, and Trayvon Martin central) and you’re lucky to see anything broadcast that occurred outside of North America. Apparently Time Magazine also feels we don’t need to know what’s happening. Back in December 2011 Time produced two separate covers based on the geographic distribution of their magazine. While the rest of world was getting an education on the Arab Spring, U.S. audiences were being told that Anxiety is actually good for you. I get it though. We are a capitalistic society. Money drives content. If CNN decided to make just 25% of their content global, they would lose a good majority of their audience. Mark Twain once said that “God created war so that Americans would learn geography“. This appears to be somewhat accurate. Although the recent conflicts in Ukraine leave me to ponder. 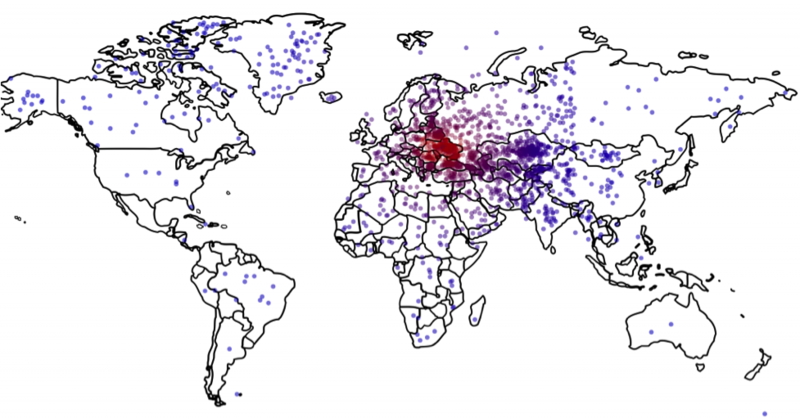 In a recent Washington Post poll, 2,000 people were asked to find Ukraine on a map. They found that only one out of six Americans can find Ukraine on a map, and that this lack of knowledge is related to preferences: The farther their guesses were from Ukraine’s actual location, the more they wanted the U.S. to intervene with military force. Looking at the map, most thought that Ukraine was located somewhere in Europe or Asia, but the median respondent was about 1,800 miles off. Some even thought Ukraine was in their own country?!? So how are we doing in 2014? Not much better. The other day I found out there’s a few places in the U.S. that are so lacking in geography knowledge, its costing people their jobs. A school in New Jersey had notified parents that two students from an east African nation had enrolled. They were supposed to begin classes the next week; however, after backlash from parents, those kids are now being kept out of school. The school nurse sent a letter to staff members saying that the students moved from the east African nation of Rwanda and are starting class next week. Even though it’s far away from the Ebola outbreak, the school was going to take precautions, by taking the African students temperature three times a day for the next 21 days. Oh man I’ve many more like these. I think you get the point. Africa is also dealing with HIV/AIDS. However having a trusted organization like the World Health Organization (WHO) offer a map that shows most of Africa aggregated together struggling with the high prevalence rate doesn’t help convey the data correctly. South Africa suffers from a much higher prevalence than does some of the equatorial African countries. 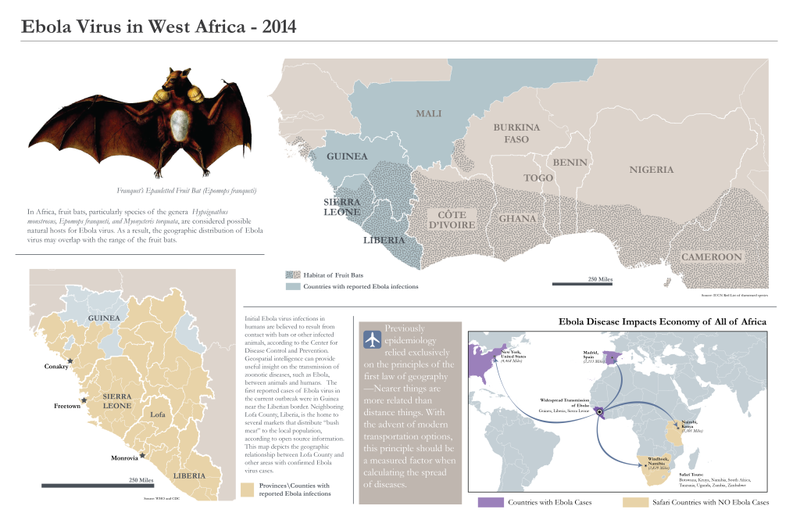 This map does a very poor job in conveying this information correctly. Let’s close out by staying in Africa. With the ongoing fight against Ebola, other parts of the second largest continent are also feeling the effects of the disease. A recent survey conducted by Safaribookings.com of 500 tour operators found that they are experiencing a 20% to 70% drop in forward bookings because of fear of Ebola. Last time I checked there are travel warnings for countries experiencing an Ebola outbreak; not those on the other side of the continent. In fact, Sierra Leone’s capital of Freeport, one of the cities hardest hit by the disease, is closer to Paris than it is to Johannesburg, South Africa. Although, should distance really be a considered factor? Take a look at the above map produced by Safaribookings.com. They are presenting distance as their argument to not cancel your safari this year. Although the first rule of geography is indeed in play in areas around the outbreak, it does not hold water when modern transportation infrastructure is factored in. The map tries to argue that because the safari countries are farther way (even more than Europe), that it’s safe to keep your reservations. However all they need to mention is that destinations farther away (New York/Dallas) are easier to travel to and therefore are essentially more susceptible to the disease. The first rule of geography states that nearer things are more related than distant things; however, if distant things take less time and effort to travel to, then this rule should be ignored. We continue to look at Africa as one country. This not only hurting business but may ironically affect the lives of the very animals that the safari companies are exhibiting. Safari operators are not wealthy people. They rely on the income that their business generates. If they are not getting paid they are not eating. If they are not eating they will resort to poaching. I created this infographic to help people understand two things: Africa is huge and events in Western Africa should not impact the economy in the south of the country. Even though the U.S. is much further away, modern transportation options are making it easier for the disease to spread. Epidemiology studies investigate their causes (Fruit bats/Bush Meat) and spread (geography). 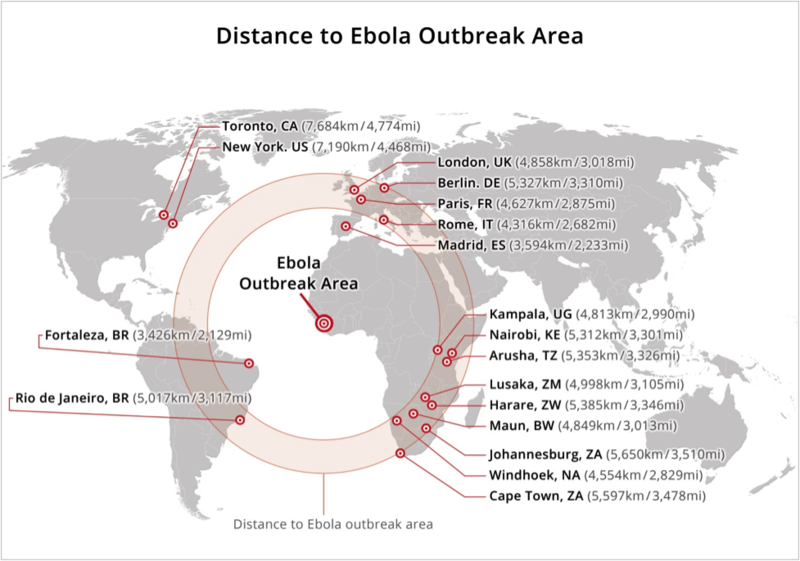 However the spread of Ebola, this globalization should be a measured factor when calculating the spread of diseases. 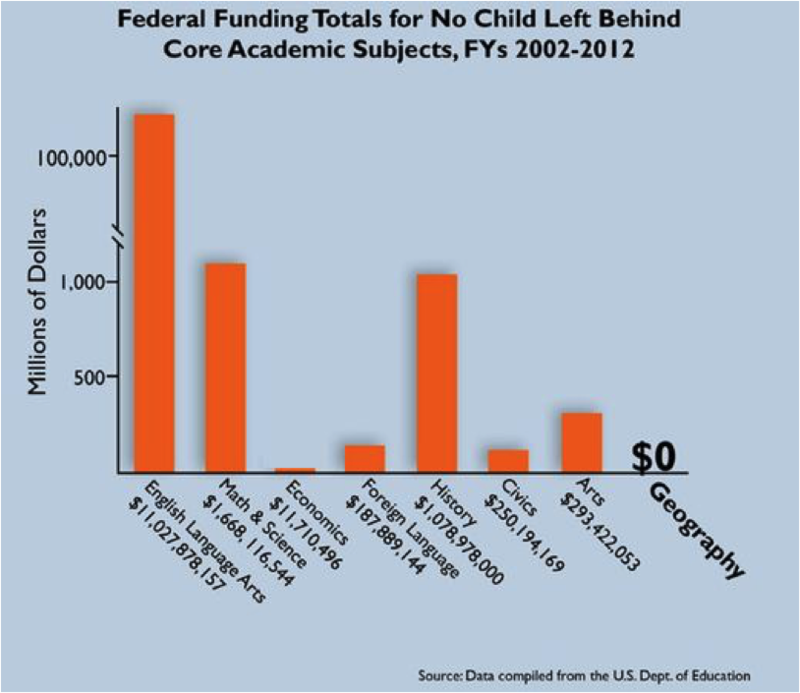 Perhaps a solution is for the educational system in the U.S. to reevaluate their funding?